This blog does not claim copyrights for any third party text/images/other documents displayed here. The copyrights for the documents rest with the respective authors. 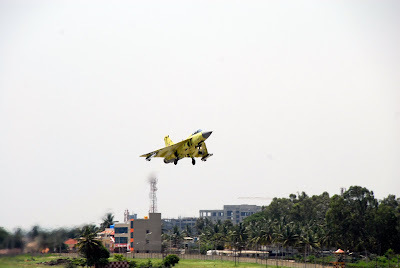 BANGALORE: The first flight of Tejas Aircraft LSP-4 (Limited Series Production aircraft) took to the skies on Wednesday, going supersonic touching a 1.1 Mach speed. The aircraft took off at 1110 hrs from HAL's Bangalore airport and landed forty minutes later, a DRDO release said. The flight marks for the first time a Tejas aircraft flying in the configuration that will be finally delivered to the Indian Air Force. This milestone is another step in the direction of releasing the Tejas for IAF service, which is planned for December 2010, it said. In the sortie, test pilot Gp Capt Suneet Krishna flew the aircraft to an altitude of 11 kms and went supersonic, touching 1.1 Mach speed with Test Director, Gp Capt D Chakravorty, guiding him from the telemetry facility of National Flight Test Centre. For all first flights of prototype aeroplanes, it is a standard operating procedure to have another aircraft chase the aircraft under test. In this case, the chase aircraft was flown by the Chief Test Pilot of NFTC, Gp Capt RR Tyagi with Wg Cdr Prabhu as the Test Director. The Indian Navy has a considerable stake in the programme, as they look to replace their Sea Harrier fleet, which is due to be phased out in due course. Senior scientists from ADA, NAL and ADE were involved in the development and flight test planning of the newly integrated flight control software which was used by the test aircraft. Programme Director of Aeronautical Development Agency, P S Subramanyam said the Tejas team was now heading to central India to carry out hot weather trials. He expressed confidence that the aircraft would soon be flown by operational pilots of the defense services. NEW DELHI: India will introduce an advanced fighter jet it is building with Russia in 2018, a move that will bring sophistication to its air power but could also spark unease among neighbours China and Pakistan. New Delhi has watched warily as China has made rapid strides in defence, worried that Beijing's long-term strategy for the region could involve encircling India. Indian military commanders have stressed greater firepower as a counter-measure, particularly for the air force. The fifth generation fighter aircraft joint project with Russia is part of that strategy. "The fifth generation aircraft would possess technologies which would provide it (India) the edge over adversaries in future air warfare," PV Naik, the Chief of the Indian Air Force (IAF), said. "China is rapidly modernising its air force ... On our part, the IAF is reviewing its tactics regularly to increase its combat potential," Naik said. India's plans to bolster its air force include upgrading more than 50 airbases along the Chinese and Pakistan border, he said. Traditionally, any move by India to acquire new weaponry has been met with similar moves by Pakistan, putting already fragile regional security under further strain. The fifth-generation fighters, billed as a competitor to the US F-22 Raptor, can fool sophisticated radars and will be able to take off from short airstrips and remain in the air for longer than the current fighters, air force officials say. India's air force says it has more than 800 active combat aircraft but is dwarfed by China's, which has more than 2,000 fighter aircraft. Arms procurement is a painfully slow process in India because of red tape and charges of corruption in winning tenders. India plans to procure at least 200 of the fifth-generation fighters, each valued at $100 million, in a deal which analysts say is watched with unease by neighbours Pakistan and China. 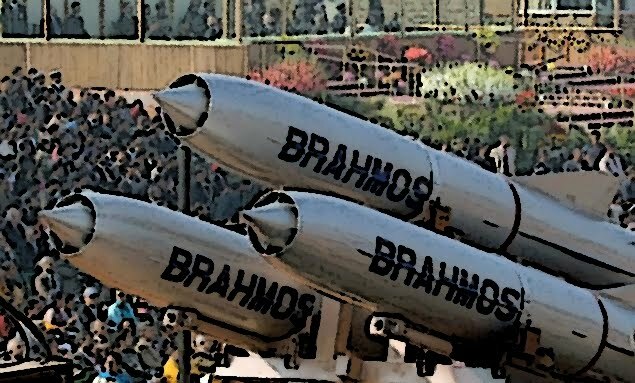 India is looking to spend more than $50 billion over the next five years to modernise its largely Soviet-era weapons systems. The governments of Russia and India have already signed the deal for the advanced jet, although the two companies that will build them have not. Officials say that is just a formality and will be completed this year. Production of the stealth jet fighter is a 50-50 joint venture between Russia and India's state-run Hindustan Aeronautics Limited (HAL), which will build a mission computer, cockpit displays and other navigation systems. India is also buying 126 multi-role fighters and will pare down the number of bidders for the $11 billion deal by June or July, Naik said. That contract is one of the world's biggest arms deals. Humour for a good day! Having just moved into his new office, a pompous Group Captain recently appointed COO (Chief Operations Officer), was sitting at his desk when an airman knocked on the door. Conscious of his new position, the officer quickly picked up the phone, told the airman to enter and gestured that he was speaking to the AOC, then said into the phone, "Yes sir, I'll be seeing him this afternoon and I'll pass along your message. Thank you for your good wishes, sir." Feeling as though he had sufficiently impressed the young enlisted man, he asked, "What do you want?" "Nothing important, sir," the airman replied, "just here to hook up your telephone." A young sentry, on guard duty for the first time, had orders not to admit any car unless it had a special identification seal. The first unmarked car the sentry stopped contained a Air Vice Marshal. When the officer told his driver to go right on through, the sentry politely said, "I'm new at this, sir. Who do I shoot first -- you or the driver?" Fighter spotting - IAF MiG-21 at Nicco Park, Kolkata!